In the neurons of people with amyotrophic lateral sclerosis (ALS), misfolded proteins form large aggregates. Researchers have long suspected that cells inadequately respond to these maladaptive proteins, but have had little in the way of proof. Now, two new papers offer genetic evidence that the machinery to clean up malformed proteins is ineffective in ALS. The authors of an August 21 Nature paper online report on a decades-long analysis culminating in the identification of a ubiquilin 2 mutation in a large family with ALS. On August 12, the Annals of Neurology posted a report that a mutation in the sigma-1 receptor causes juvenile ALS in a family in Saudi Arabia. In the Nature paper, researchers led by senior author Teepu Siddique at the Northwestern University Feinberg School of Medicine in Chicago, Illinois, report that a ubiquilin 2 mutation is responsible for ALS in a handful of families. Ubiquilins are responsible for delivering ubiquitinated proteins to the proteasome for degradation. Like many ALS-linked proteins, the mutant ubiquilin forms aggregates in the spinal cord. Moreover, ubiquilin 2 aggregated in every ALS case the researchers examined, including both sporadic and familial ALS. Thus, ubiquilin 2 inclusions are likely to be a common factor across ALS pathology, and a crucial clue toward disease mechanism. The report is going to be of pretty significant impact to the field, no doubt about it, said Randal Tibbetts of the University of Wisconsin-Madison, who was not involved in the study. The results really open up the door to studying the importance of proteostasis to the initiation and development of ALS, he added. Amr Al-Saif at the King Faisal Specialist Hospital and Research Center in Riyadh, Saudi Arabia, led the authors of the Annals of Neurology report. The researchers identified a mutation in another family, in which ALS symptoms appear in children as young as one year old. Their analysis led them to the sigma-1 receptor; this protein serves as a chaperone in the endoplasmic reticulum (ER), where it suppresses protein aggregation. The mutation might disrupt this function, leading to upregulation of the unfolded protein response and ER stress, suggested Bradley Cooper, of King’s College London, U.K., in an e-mail to ARF. That stress could eventually kill neurons, wrote Bradley, who was not part of the study team. Siddique has been pursuing the genetic defect in one family with ALS for decades, stymied by its unexpected dominant, X-linked mode of inheritance. He first described the affected family in 1989 (Siddique et al., 1989). The kindred, encompassing five generations, included 19 people with ALS. They sickened as young as 16 and as late as 71 years of age. Initial searches for gene variants pointed toward chromosome 21. Although that chromosome was a red herring for the family in question, it did lead Siddique to discover another important ALS mutation, in superoxide dismutase 1 (SOD1) (Rosen et al., 1993). Joint first authors Han-Xiang Deng and Wenjie Chen directed the work that finally led to the right mutation. The researchers had noticed that the male family members suffered more severe disease than the women, but thought little of that since ALS generally affects more men than women. But finally, in frustration, Siddique decided to look more closely at the X chromosome. There, in 2000, the team found their answer. Linkage analysis pointed to a high likelihood that the causative mutation fell within a 21-megabase region of the X chromosome. There were 191 protein-coding genes in the area, and the team sequenced them one by one. On their forty-first try, they hit upon the mutation in ubiquilin 2. Widening their search, they found other ubiquilin 2 mutations in four other families with a condition Siddique calls ALS/dementia, which combines frontal lobe dementia with the motor neuron disease (Geser et al., 2010). These variants did not appear in ubiquilin 2 genes in 928 control subjects. While the researchers do not know the overall population frequency of the variants they observed, Siddique suspects the mutations are quite rare. All of the ALS-linked ubiquilin 2 mutations fall into a region of proline repeats. These kinds of sequences are often part of protein-protein binding domains, so Siddique suspects that the mutant protein cannot attach to its usual partners. However, he noted, that may or may not be the problem that is most important for causing neurodegeneration. In autopsy samples from people who had ubiquilin 2 mutations, the researchers discovered that the protein formed inclusions in the spinal cord. These aggregates also included ubiquitin and the ALS-linked proteins TDP-43, FUS, and optineurin. Broadening their scope, the team analyzed 41 more postmortem samples, including cases of sporadic ALS and familial cases with unknown mutations or known genetic defects in SOD1 and TDP-43. In every instance, ubiquilin 2 inclusions appeared. Ubiquilin 2 also showed up in membrane-bound, eosinophilic—that is, alkaline—inclusions in the brains of people. Siddique said these bags of membranous inclusions are a novel kind of pathology, distinct from the skein-shaped inclusions he observed in the spinal cord. Thus, defects in ubiquilin 2—and by inference, the proteasome degradation pathway—appear to unite disparate causes of ALS (see ARF related news story on Deng et al., 2011). The researchers examined the functional consequences of ubiquilin 2 mutations in mouse neuroblastoma cells. They transfected the cells with a green fluorescent protein (GFP) DNA sequence linked to the nucleic acid sequence for ubiquitin; the resulting protein comes with built-in ubiquitin tags and should be immediately degraded by the proteasome. 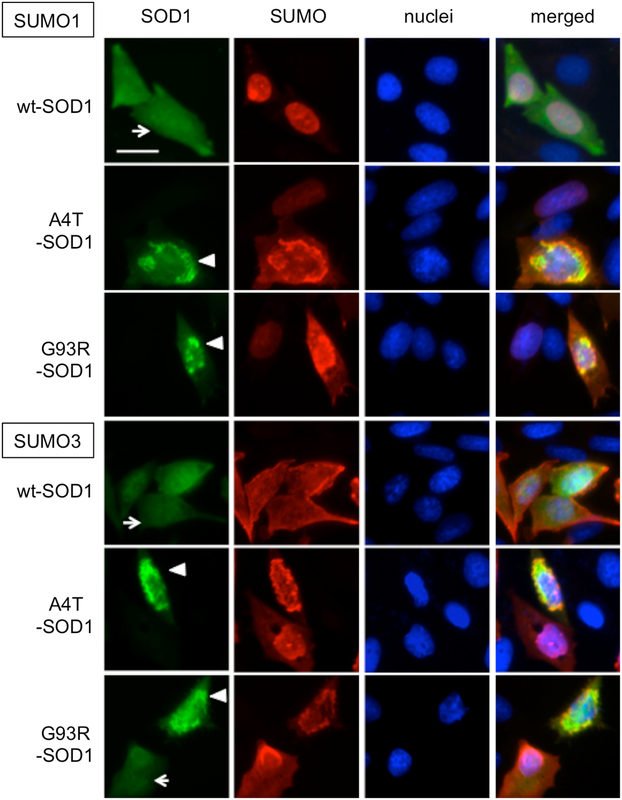 However, the fluorescent reporter accumulated in cells transfected with the mutant ubiquilin 2 and the GFP-ubiquitin construct, suggesting that delivery to the proteasome, or perhaps the protein degradation machinery itself, must be compromised. The same may be true in ALS, and since ubiquilin 2 regulates its own degradation, loss of function mutations would cause a vicious cycle of accumulation, Siddique noted. However, it is not yet clear how wild-type ubiquilin 2 fits into ALS pathology, Tibbetts said. Ubiquilin 2 might be causing aggregation, or clearing it up, he suggested. Other evidence points to ubiquilins as players in neurodegeneration. Ubiquilin 2 evolved from ubiquilin 1, which lacks the proline repeat domain. Ubiquilin 1 is a candidate gene for Alzheimer’s disease (Bertram et al., 2005; see also Alzgene entry), and has already been shown to interact with TDP-43 in vitro, in yeast and in fruit flies (Kim et al., 2009; Hanson et al., 2010). These two proteins are at the scene of the crime, so to speak, Tibbetts said. Their job is to clear [aggregated] proteins out. A small molecule that puts the ubiquitin-mediated proteasome pathway to rights could be an effective therapeutic, Siddique suggested. In Saudi Arabia, Al-Saif and colleagues were dealing with a local family in which six members developed juvenile ALS at one or two years of age. From the pedigree, the team could tell the mutation was recessive, so they analyzed four of the affected members’ DNA for homozygous regions. This led them to a nine-gene region on chromosome 9 and ultimately to the sigma-1 receptor. The sick children had a glutamine-to-glutamic acid mutation at position 102 of the receptor. Analysis of DNA samples from 271 control subjects found no such mutation. The sigma-1 receptor is a membrane protein involved in preventing aggregation in the ER, among other tasks. The mutation lies in a transmembrane domain, and thus might shift the receptor to different kinds of membranes, Smith suggested. Indeed, using sucrose gradients, the authors found that the mutant form of the receptor appeared in lower-density membranes than the wild-type version. The sigma-1 receptor normally blocks apoptosis caused by ER stress; this kind of stress has already been implicated in ALS pathology (see ARF related news story on Saxena et al., 2009). The team examined the effects of their mutant in NSC-34 cells, a line from a fusion between mouse neuroblastoma cells and a mouse motor neuron-enriched population. When exposed to the ER stressor thapsigargin, cells expressing the mutant receptor were 1.7 times more likely to undergo apoptosis than those making the wild-type version. Similarly, another group reported that sigma-1 receptor knockout doubles apoptosis rates (Hiyashi and Su, 2007). The sigma-1 receptor is not a complete stranger to the neurodegeneration field. An Australian team reported in 2010 that a mutation in the 3′-untranslated region of the gene was responsible for some forms of motor neuron diseases with frontotemporal dementia (FTD) (Luty et al., 2010). The receptor mutation lies tantalizingly close to an area of chromosome 9, called the ALS-FTD2 locus, which researchers have linked to ALS and frontotemporal dementia (see ARF related news story on Shatunov et al., 2010 and Laaksovirta et al., 2010). Could the receptor be the sought-after ALS-FTD2 gene? The genetic variant in the chromosome 9p13.3-21.3 locusmight be related to sigma-1 receptor, the authors wrote. Smith was more cautious, noting that members of the Saudi family showed no signs of dementia, and exhibited an unusual form of ALS with early onset and long duration. It is unlikely, based on current evidence, that sigma-1 receptor has a causal role in ALS patients with linkage to the ALS-FTD2 locus, he wrote. Naturally, the authors stated, there is more work to be done to understand sigma-1 receptor’s role in ALS. However, they do note that sigma-1 receptor agonists are neuroprotective during stroke (Katnik et al., 2006; Takahashi et al., 1996; reviewed in Maurice and Su, 2009), and suggest this receptor as a potential therapeutic target for ALS. Al-Saif A, Al-Mohanna F, Bohlega S. A mutation in sigma-1 receptor causes juvenile amyotrophic lateral sclerosis. Ann Neurol. 2011 Dec;70(6):913-9. Epub 2011 Aug 12. [Pubmed].